One of my frequent customers requested a custom order that at first scared me off a bit; it seemed too complicated. But after a little more discussion and thought, I decided I could make something I'd be proud of - and decided to step out of my comfort zone a little. Here is the result - gnome and toadstool longies! It took a little more work, but it felt good to let my creativity shine. Plus, I was able to work with one of my best customers and get her something she truly wanted - and that feels good! Now, I can't say I can ever create these again - they are truly one of a kind! Each piece was cut free-hand. Sometimes it's good to think outside the box you create for yourself. This summer I also set a goal to be able to run a 5K - and started the Couch to 5K training program (Yes, I truly was a couch potato...and I'm going into week 5 already and can run for 5 minutes!) Is there something you've tried recently that you were hesitant at first, but once you did it, you were happy? Please share! 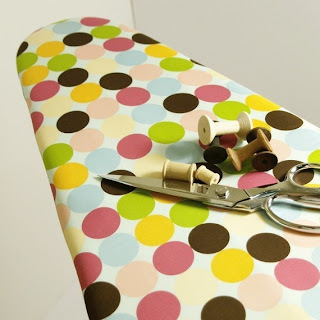 Ironing board covers add some pizzazz! It's true, it's really not a major breakthrough, but what a fun way to add a little something to a space! I had no idea people were even making these until I saw a patterned cover on a blog about laundry room organization, and started searching. You can find lots more by doing a search on Etsy. Once I get my new cover and some other things settled, I'll post an "after" picture!